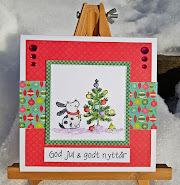 Hos Dorte: Happy Christmas, DT card for ABC Christmas Challenge. Happy Christmas, DT card for ABC Christmas Challenge. We want you to get inspired by this beautiful photo and make a Christmas Project. and I have made a little garland with baubles in different colours. The image is from Penny Black, it's the first time I ink it up. As you can see I have added Stickles to the image. because it only had my usual 'Handmade by' in a scalloped oval. for you to become one of the random picked winners. 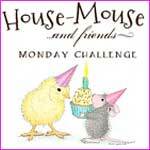 and a Guest Designer each month at the Meljen's Designs Blog. to browse all of Melissa's lovely designs! We are looking forward to seeing the ways that you are all inspired by the photo. Wonderful card. The fun bright colours are perfect. what a fun and beautiful card Dorte. Ohhh Dorte, this is GORGEOUS!!!! I love the little row of balls....and that image is PERFECT!!! So cute!!! !